that guitar out of their closet again. prerequisite is entry­level ability to play a pre­approved instrument. “If you can walk, you can dance, If you can talk, you can sing,” said Perry. “We work with what we have,” said Moran. librarian, but has since become solely dedicated to the class. typically older group would certainly welcome younger faces. with encouragement, everybody gets better,” said Mike Paul. class. Paul grew up in the Seattle area and was an Ebbtide associate editor from 1972 to 73. 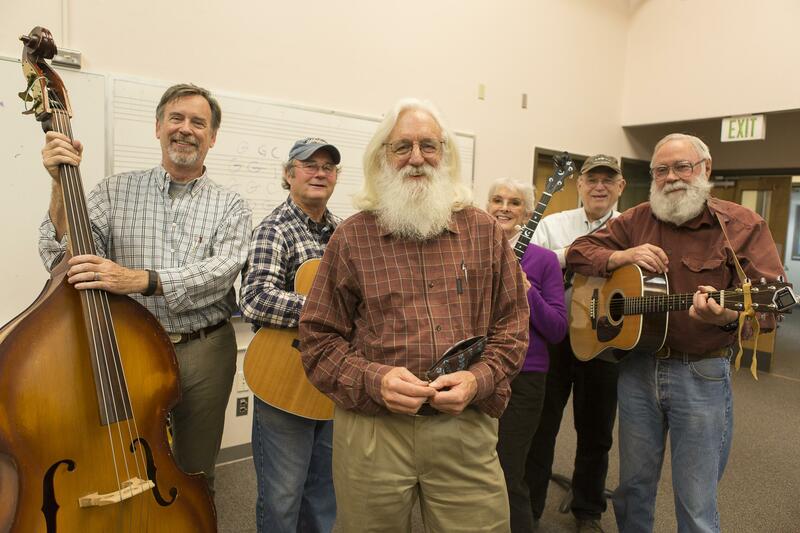 “Entering the bluegrass community was a way to play music whenever I wanted,” said Paul. But what makes a band a bluegrass band? bluegrass exploded across the country. into their music through covers and in the long improvised jams they were famous for. simple rhythm and the rest of the band follows by layering on top of it. where musicians do a little improvisation anchored to a theme. they are ready to perform. two to eight, which practice separately from one another. she met Cliff and found out about his class. those with instruments and a little skill to join in their jam. Bellevue Hilton in late February.